The decision was backed by Minister Frances Fitzgerald. 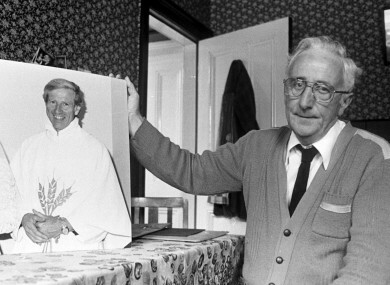 Billy Molloy pictured with a photo of his brother Fr. Niall Molloy. A DECISION THAT there is to be no fresh inquiry into the death of a priest 30 years ago has been backed up by a government review. The DPP previously decided, following a review by the Garda Serious Crime Review Team, that there would be no further charges brought into the death of Fr Niall Molloy in 1985. Today, Minister for Justice Frances Fitzgerald published a report into that review by Dominic McGinn SC. It backed up that no further inquiry would be warranted. Fr Molloy was found dead in the home of his friends Therese Flynn and her husband Richard in Clara, Co Offaly in July 1985. Gardaí investigating the death found evidence of violence in the couple’s bedroom, where Molloy had been found, and pools of blood on the ground – leading to the arrest of Richard Flynn who was charged with manslaughter. His controversial trial saw the judge direct the jury to find the defendant not guilty – only four hours after the trial began – when the defence counsel suggested that Fr Molloy could have died from a heart attack or of other natural causes. McGinn’s report published today outlines that the “precise events surrounding Father Molloy’s death cannot now be ascertained”. This is due to a number of reasons including, “the death of many of the pertinent witnesses, and the reluctance of others to give evidence”. Media reports, mostly by former Irish Independent journalist Gemma O’Doherty, alleged that some witness statements were mishandled. They, in part, led to the major garda review and this latest independent examination. The review acknowledges that “unanswered questions do remain” but finds that they would likely not be answered by further investigation. The watch Fr. Molloy was wearing on the night he died, stopped at 10.30 pm. Justice Minister Frances Fitzgerald says she understands that the decision will be a disappointment to Fr Molloy’s family. She adds, however, that the report sheds some extra light on events but does not back up concerns about the investigation. It sets out shortcomings in the original investigation, which were identified by the SCRT review. The report does not answer all of the questions raised, however, and concludes that the precise events surrounding Father Molloy’s death cannot now be ascertained. In these circumstances, Mr McGinn recommends that examination by a further inquiry would not be warranted. Fr Molloy’s time of death was never established with his watch broken at 10:30pm, suggesting that he may be have been dead for a number of hours before gardaí were called at 3.15am. Email “Definitely no re-investigation into mysterious death of Fr Niall Molloy ”. Feedback on “Definitely no re-investigation into mysterious death of Fr Niall Molloy ”.